If you want to answer everything, there just might not be room in your deck for those pesky Felidar Guardians, or even for Saheeli Rai herself. Once you've established control of the game, there's plenty of time to kill your opponent with a Torrential Gearhulk, or maybe a Wandering Fumarole if it comes to it. That's the philosophy behind Gregory Orange's Blue-Red Control deck, which he piloted to a 4-1 finish in the Standard portion of Day One. 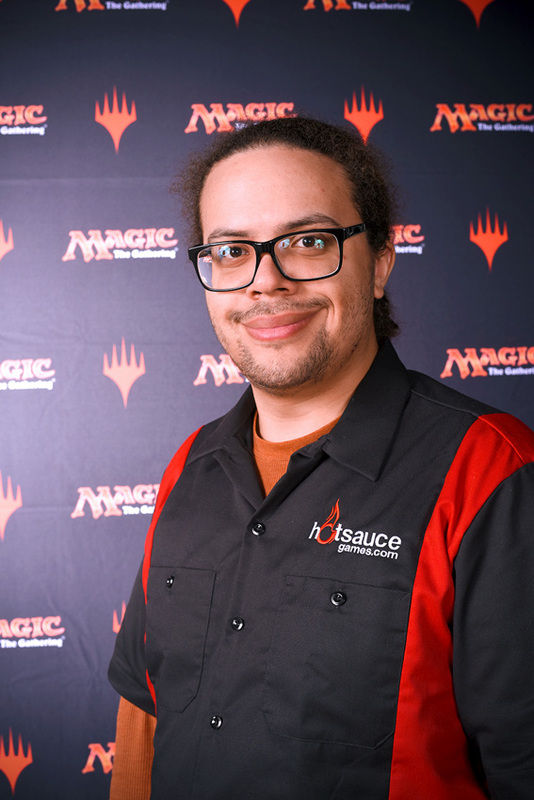 Orange is representing Team Hotsauce Games, and has played control decks to Top 25 finishes at several previous Pro Tours. "It's super durdly," Orange said of the deck he brought to Pro Tour Aether Revolt. If you've seen him play at a Grand Prix or a previous Pro Tour, it makes a lot of sense. Across formats, across Grand Prix, across Pro Tours, super durdly is Orange's deck of choice. This time around, Orange built his deck "to cast Torrential Gearhulk, and to counter a lot of spells." The makings of a "super durdly" deck. Pieces of Orange's deck will look familiar to those acquainted with the Jeskai control lists making the rounds at events both before and after the introduction of Aether Revolt. There's burn-based removal and a suite of counterspells to keep opposing threats off the table. A full four of each Glimmer of Genius and Anticipation generate card advantage and help Orange see a far larger number of cards in his deck. He also has a pair of Dynavolt Towers to give all those instants extra punch later in the game. "I've got some spicy Limited commons," Orange said. "I've got Leave in the Dust. I've bounced some 8/8s with Leave in the Dust, drawn some cards, it was pretty nice." The citrus assassin is known for his piloting of control at big tournaments, and that unsurprisingly didn't change with this Pro Tour. Saheeli Rai and Felidar Guardian are, of course, notably absent. "I think if you're trying to answer all their stuff, then it's easier to win by casting Torrential Gearhulk at that point," Orange said of his decision to stick to blue-red. "I was never really a fan of the Saheeli control deck, because I would try to not die, and I'd have a bunch of Saheelis in my hand, and then I would just lose." He didn't like playing the Saheeli combo, but that didn't stop him from bringing a deck built to beat it, since many players expected it to be a large part of the field coming into the Pro Tour weekend. Negates, Revolutionary Rebuffs, and Disallow prevent the combo pieces from ever hitting the table, and if they do, Harnessed Lightning, Dynavolt Tower, or even Leave in the Dust can prevent the Saheeli decks from creating a lethal stampede of cats. "I was probably expecting a little more Saheeli Combo and other control decks," Orange said. "I wasn't expecting quite so many aggro decks. It's not that well suited for aggro, but it's okay though. Things like Scrapheap Scrounger are tough." Despite building a deck more favored against Saheeli combo than against aggro, Orange did well on a Day One dominated by Mardu Vehicles. Opening hands with access to the deck's early, cheap plays like Galvanic Bombardment, Harnessed Lightning, and Revolutionary Rebuff are key. As the Standard metagame shifts in the wake of the Pro Tour and subsequent events, Orange looks forward to tuning and continuing to play the deck. After all, "it has some sweet cards, and I like casting Torrential Gearhulks."